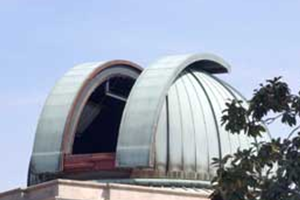 Morehead Observatory, located on the east end of the top floor of the Morehead building, houses a 24-inch (61 cm) Perkin-Elmer reflecting telescope operated by the UNC Physics and Astronomy Department. Faint object observing is still possible with narrow wavelength filters to block the city lights of Chapel Hill. The observatory supports research programs in bright star spectroscopy and optical counterparts of Gamma Ray Bursts. The official website for Morehead Observatory is here.